By John Willinsky, Chicago, Illinois: University of Chicago Press, 2017. 368 pp., $40.00 cloth. ISBN 978-0-226-48792-2. Open access is broadly viewed as a positive development in education, but its recent emergence as a “buzzword” has restrained much of the serious scrutiny it has warranted as a concept in terms of its historical and theoretical underpinnings. 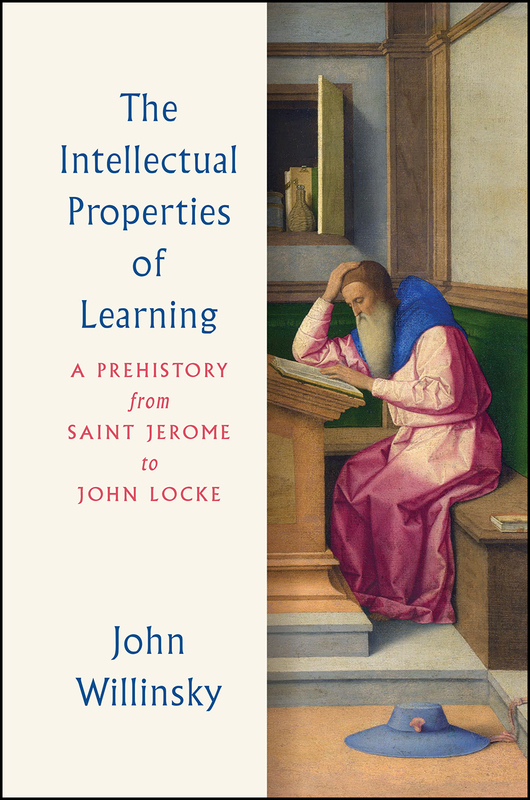 As an education scholar and activist for the open access model of learning, John Willinsky has attempted to address this problem in his latest book, The Intellectual Properties of Learning: A Prehistory from Saint Jerome to John Locke. As indicated by the subtitle, Willinsky sets out an ambitious agenda for this book. He traces the long history of intellectual property roughly from late antiquity to the close of the early modern period. As a study, this book is informed by Willinsky’s past scholarship in the areas of education history, the philosophy of education, technology and literacy studies, and scholarly communication. However, Willinsky’s interest in critical theory has had less of an impact on this book, most likely a consequence of its emphasis on the intellectual history of a concept informed more by modernism than by postmodern thought. The result presents a compelling combination of education history, intellectual history, and the history of the book. This transdisciplinary approach offers an important contribution to our understanding of a concept that continues to have real world relevance in the everyday experiences and practices of contemporary scholarship. Willinsky employs a three-part division to uncover a history that is essentially chronological in structure. Having twelve chapters along with an introduction and an epilogue, the book provides a somewhat condensed account of the inception, formulation, transformation, and eventual dissemination of intellectual property as a practicable idea. The first part of the book carefully outlines the basis upon which this notion is set to develop, as it evolved from its primordial origins in the episteme of “divine” knowledge and scriptural exegesis to its ascendancy in scholasticism’s emphasis on logical proofs and disputation (i.e. disputationes). The second part of the book deals with the maturation of universities, academies, and learned societies. Here, the author covers everything from the role that Islamic centers of learning in North Africa, Southern Europe, and Western Asia played in advancing the classical scholarship of Western civilization for subsequent generations of scholars to the intellectual cultivation of the humanities that occurred during the Renaissance. The third part narrows the focus to an in-depth discussion of Locke’s role in the history. Unpacking intellectual property is a difficult task. Doing this under the macro-historical survey model as opposed to employing a micro-historical lens poses additional challenges to the project. However, Willinsky handles this adeptly, as he weaves together discrete threads seamlessly into a cohesive whole. The transdisciplinary approach that Willinsky adopted for this book could have easily resulted in a disjointed collection of tangentially related chapters; but, again, it works here. In that sense, one with advanced knowledge in the history of the book will appreciate Willinsky’s discussion on everything from the monastic glosses of the medieval scriptoria to the printed scholarly editions of Aldus Manutius and Desiderus Erasmus. One coming from an intellectual history or even a philosophy background will find comfort in Willinsky’s selection of influential scholars from Boethius to Milton. Even library historians will notice Willinsky’s recognition of important trailblazers in the history of knowledge organization and preservation such as Cassiodorus, Bede, and Alcuin. Most readers regardless of their disciplinary affiliation stand to learn something from the manner in which Willinsky has connected these different areas of scholarship. The book is a testament, in fact, to the notion that we should view intellectual property as a concept that has been operating in a system that functions through not only the ideas that have come to define it, but also the regulatory regimes, technological affordances, academic paradigms, and commercial constraints that often control it. The “great figures” approach to intellectual property, or one that centers human agency in the development of the concept, renders a rather complex transcultural history to a Eurocentric distillation of its major advances—an outcome that the author himself admits to repeatedly in the text. The result is that contributions to this history from scholars outside the West are either footnoted or altogether omitted. A similar critique can be made of the book’s coverage of women contributors in this history. The sentiment can be encapsulated by one of his concluding lines where he states, “While this book does end on the triumphant note of ‘An Act for the Encouragement of Learning,’ it is worth observing that this early eighteenth-century encouragement did not extend in Britain at the time to admitting women to higher education (Oxford first granted degrees to women in 1920); or Jews (admitted to Oxford in 1856); or ‘dissenters’ from outside the Church of England (admitted in 1854), or Indians (admitted in 1871), and the list goes on” (317). Willinsky touches upon a major revelation at the conclusion of the book that could have led to a different version of this history had it been embraced from the start. In his discussion on John Locke’s philosophy of property in the book’s epilogue, he notes that the concept had been used to disenfranchise marginalized populations—in this case, indigenous Americans. In consideration of this factor, the following question emerges: How has intellectual property and the modalities within which it has historically functioned accounted for the exclusion and, further, the subjugation of cultures that have traditionally educated its populace under different, counterhegemonic models? It is possible that if greater attention had been devoted to non-Western models of intellectual dissemination, some of this book’s Eurocentric tendencies, perhaps, could have been mitigated. Given the subject of his book Learning to Divide the World: Education at Empire’s End (1998), the author seems well equipped to do this kind of work. Regardless of this critique, however, Willinsky has introduced a highly readable work of scholarship that stands to offer a great deal of value to the “intellectual property” discourse. It represents a great starting point for future scholarship in this area of research.